ICE South East England works to promote and celebrate the outstanding work of members. It organises awards to recognise exceptional projects, teamwork and individual excellence. 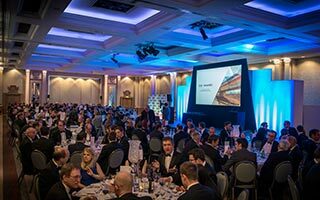 The ICE South East England Engineering Excellence Awards recognises the brilliance and imaginative concepts in civil engineering practice and construction projects as well as promotes excellence in the engineering profession within the South East England region. ICE South East ofEngland gives a number of awards to recognise the individual expertise and excellence of ICE members in the region. The Emerging Engineers Award (formally the Graduate and Student Papers Competition) promotes and rewards excellence in the originality and communication of civil engineering ideas and research. Branch heats have now taken place for the 2015 Awards. The National Final will take place later in the year. As part of the 2019 ICE Presidential Visit to South East England in July, three individuals will be recognised for their contribution to the industry and institution. This is open to members who live and work in the ICE South Branch (West Sussex, Hampshire and Isle of Wight). For an individual who has best demonstrated the professionalism and integrity of a civil engineer. We are looking for those who have gone above and beyond to advance the profession and share the value of Civil Engineering in the community. The award honours ICE Members that have shown outstanding commitment to civil engineering by giving their time to represent the ICE and promoting the profession to inspire the next generation. This award is designed to recognise and reward the most accomplished and promising young professional. This award is open to Graduate Engineers, Apprentices and Technicians who have greatly contributed to the profession in the last 12 months. Download the entry form and submit your entry before 2pm Friday 31 May 2019. The regional winner will be shortlisted for the Pitch 200 Final where the overall ICE Ambassador for 2020 will be awarded. The ICE London and South East England region Pitch 200 is open to all current ICE members who live, work or study in the South East England and London region. Registration of intent to join the competition by submitting 60 second summary video by 01 March 2019 to: [email protected].